If you are looking for Hamakua Coast land for sale, chances are you are also interested in farming or at least growing your own food. Hawai’i Island is frequently called the breadbasket of Hawai’i for good reason. There are 4,282 farms on the island covering 686,856 acres. Agriculture on Hawai’i Island is a $247 million industry covering everything from aquaculture to tropical flowers and from coffee to cattle. There are 790 coffee farms alone—many on the Hamakua Coast. It’s worth pointing out that half of all farms on island are smaller than 10 acres in size and are owner operated. 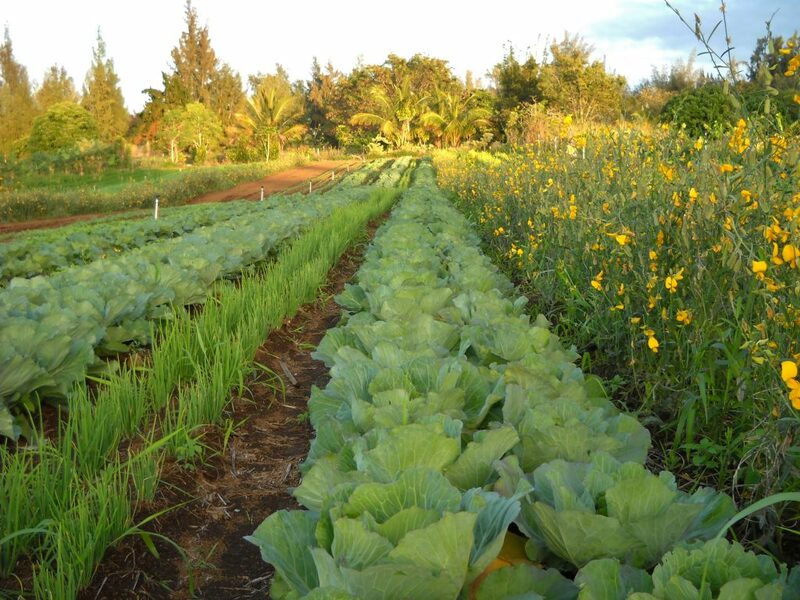 Land along the Hamakua Coast, in particular, is sought out by farmers because of the rich fertile soil, sunny temperate days and generous rainfall that are ideal for several types of crops. Did you know that sweet potato is one of the most popular and successful crops grown along the Hamakua Coast? Hand in hand with all this farming is the popular “farm-to-table” culinary trend that was spearheaded in Hawai’i by a handful of local chefs, including Peter Merriman on the Big Island. Many island restaurants from casual haunts to high-end resort restaurants tout that they serve locally grown produce, buying their produce from farmers on the Hamakua Coast. If you’re interested in purchasing property along the Hamakua Coast with the intention of growing your own food, check out Kuwili Lani, a brand new intentional community in Laupahoehoe. There are nine vacant lots for sale at Kuwili Lani, all just over an acre in size. All available Lots can be seen on the Hawaii Life Website. As people become more aware with what they eat, farmers markets, already popular in Hawai’i, are increasing in number and produce sold. Up and down the Hamakua Coast, you’ll find weekly farmers markets like Hamakua Harvest every Sunday in Honoka’a and a farmers market every Tuesday in Hakalau. Waimea Town also hosts five weekly Farmers’ Markets, A Guide to Waimea’s Farmer’s Markets. This increase in farmers markets means more opportunities to sell produce you grow on your own land. Even backyard farmers who find themselves with too much bounty after sharing with friends and family can sell their produce to local stores and restaurants. With interest rates still low and a variety of farming opportunities available, now is a great time to consider purchasing Hamakua real estate.